Government-funded awards should ensure the money is well managed and spent. All major sports teams have a farm team that makes sure the big league teams have a constant supply of athletes. Breeders are that pipeline in horse racing. Every healthy racing jurisdiction has a healthy breeding industry associated with it, but Ontario’s supply chain is suffering. The incentives that were once offered have been depleted, and what little is left is under threat. Ontario’s Thoroughbred Improvement Program (TIP) will offer just over $12 million in 2019. Much of that money is used by Ontario Racing to support purses paid to owners in restricted, Ontario-Bred, and Ontario-Sired races, and roughly $3 million for breeder and stallion awards. Breeders also benefit from an additional $2 million that comes directly from the Ontario Ministry of Agriculture, Food and Rural Affairs (OMAFRA) which funds the Enhanced Breeder Awards (EBA). The Canadian Thoroughbred Horse Society and OMAFRA work together to make sure that these funds directly reward the breeders. I’m concerned, however, that there may be an effort to re-direct the OMAFRA money to TIP which is managed by Ontario Racing. Some might argue that it makes sense to have all funds together in one pot, but when you consider the ongoing tension between racing and breeding leaders the move seems designed to further remove the breeders’ input and puts the funds at risk of disappearing into other initiatives that don’t directly benefit breeders. The new makeup of the TIP committee, which has greatly diminished the input and involvement of Ontario breeders, makes such changes more likely. The previous committee of 11 members was comprised of three CTHS directors, four breeders-at-large as well as one representative each from Woodbine, Fort Erie, HBPA, and OR. This gave the breeders a strong voice as to how the TIP funding was allocated. Thanks to a decision last year by OR, the TIP committee now consists of just five members comprised of one CTHS director and one each from Woodbine, Fort Erie, HBPA, and ORM (a wholly-owned subsidiary of WEG). Therefore, the six members who were eliminated are ALL breeders (two CTHS directors and all four breeders-at-large). This change neuters the breeders by effectively eliminating their vote in favour of the racetracks. Ontario Racing made the decision to implement these changes to the TIP committee with no consultation from the breeders – the phrase “conflict of interest” comes to mind. One could reasonably argue that OR’s vision seems focused on WEG’s core product of racing, while the breeders – the producers of the product (racehorses) – are being marginalized. The breeders do not have proper and proportional input into the development of the future of the industry. This creates instability and further erodes the confidence among its participants. These kinds of unilateral decisions make it all the more important that the breeders keep their association and funding with OMAFRA. In fact, in the spirit of keeping all the money in one pot, I think it makes the most sense for the CTHS – business savvy breeders democratically elected by fellow Ontario breeders – to manage all the money meant for the benefit of breeders through OMAFRA. The two organizations have the best understanding of agricultural and breeder needs and are best suited to managing the funds ($3 million from TIP together with the $2 million from OMAFRA). This would give the breeders the much needed assurance and confidence they need to invest in more breeding. Ontario Racing could quickly and dramatically ease the tension with breeders by agreeing to this one reasonable option. 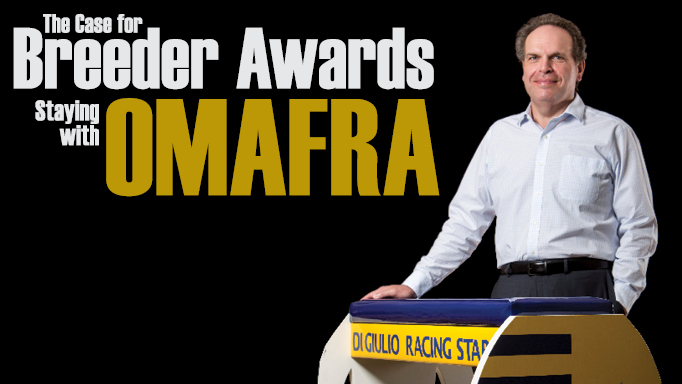 The government specifically directed funds to OMAFRA in 2014 after the outcry from breeders following the end of the Slots at Racetracks Program (SARP). The money was meant for the benefit of Ontario breeders and to help support the economy of rural Ontario. OMAFRA is, after all, a Ministry that deals with rural affairs which includes thoroughbred breeders and the many Ontarians they employ directly and indirectly through feed companies, truck and farm equipment dealers, veterinarians, blacksmiths, shipping companies, tack shops, etc. Making the thoroughbred breeding industry healthy and viable is critical in ensuring these many jobs are not lost. Agriculture is the biggest employer in Ontario and the horse racing and breeding industry is a major part of that employing close to 50,000 people. At a time when Ontario is experiencing a serious horse shortage, the most logical solution lies in supporting the breeders in our own backyard. Breeder awards give them hope of a return beyond the sales ring, and the icing on the cake is that by supporting Ontario breeders the money also supports the rural economy and the many jobs associated with horse racing. Just as purse bonuses are paid to owners to encourage Ontario horse ownership, breeder awards are vital to support the producers who make the initial investment. With the declining sales averages that don’t come close to covering breeding costs, breeders sometimes are forced to sell their horses at a loss in the hopes that they will find a home with a successful owner and trainer to earn the breeder some money over a horse’s racing career. By continuing to host the program with OMAFRA, or ideally increasing it, breeders can be assured that the funds will be properly managed by those with their best interests in mind. Including the TIP money, as well, would go a long way to assuaging fears. The breeders of Ontario, the individuals that have the most invested and contribute the most to the economy of Ontario, have the least amount of input in to how their business is run while major decisions are left to individuals who have little or no skin in the game. After several tumultuous years, Ontario breeders badly need the reassurance of a stable and well managed program. In closing, I would like to reiterate an earlier point in the hopes that the powers that be take note: every healthy racing jurisdiction has a healthy breeding industry associated with it. If the latter dies, the former will soon follow.